Each PMHI package begins with the walls being designed by a computer, then pre-framed in sections or panels in exactly the same manner as on a jobsite except we use jigs and fixtures. Only dry Douglas Fir lumber is used. Less expensive and lower strength species, such as Hem Fir, do not meet PMHI's requirements due to their tendency to warp and twist. All PMHI wall panels are sheathed in our factory with at least 3/8" OSB, per the engineer's requirement for proper shear values. 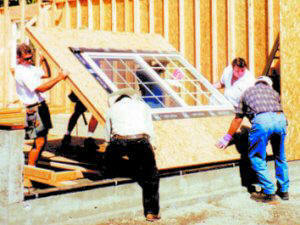 Then the windows are installed and flashed as required by the California Building Code (CBC). PMHI, as an authorized Alpine truss fabricator, we use computers to design and then we fabricate all roof trusses to your specific plan and location requirements. Only Douglas Fir lumber is utilized, and mostly #1 or Better grade for chords and webs. 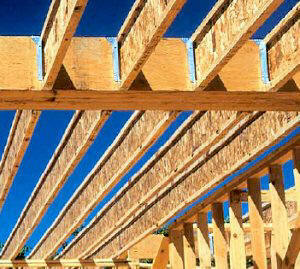 Your roof truss material will be cut with "state of the art" computerized optimizing saws and assembled on the most modern of jigs, fixtures and presses. 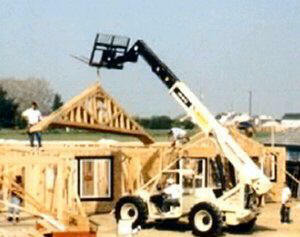 Attention is always given to tight fitting joints to ensure a stronger truss and a more even roof line. Our consistent rating of "Excellent" during periodic unannounced third-party inspections (as required by the CBC) attests to our attention to quality. Cost effective and environmentally friendly alternatives.